Water softeners remove mineral deposits from hard water, which is water bearing certain minerals. Hard water diminishes soap sudsing and makes water feel slick on your skin, but it's not dangerous to consume. Water softeners are simple household appliances -- essentially a pump, a filter and a thank that contains salt or resin pellets designed to attract negatively charged ions out of the water. This resin is usually some type of synthetic bead that attracts positively charged particles in the form of calcium and other mineral deposits, extracting them from the water as it flows through the bed. 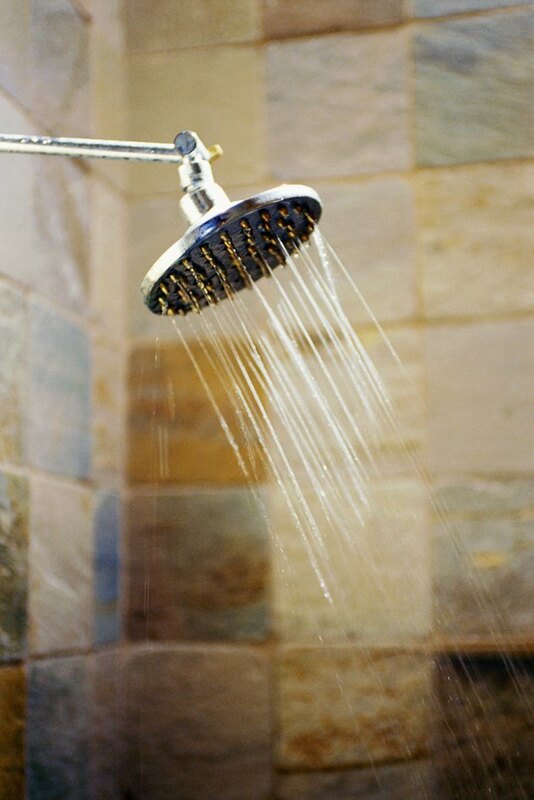 Water softners can create a more pleasant shower experience. After a while, the resin in water softeners becomes saturated by calcium and other mineral particles; for the appliance to continue to diminish water hardness, the pellets must be rinsed clean. This requires that the machine regenerate or recharge the resin bed, which it does by washing a saltwater solution over the resin. The softener has several moving parts, such as a mechanical motor, that may cause a screeching noise. Many people mistake this noise for some sort of mechanical problem when, in fact, the softener is simply doing its job. However, that doesn't mean the machine can't screech otherwise, because it can -- particularly if it's poorly lubricated, or if the valves are opening only slightly or are calcified. One possible source of a screeching noise in a water softener is the timer motor, which is responsible for determining when the softener is supposed to regenerate the resin. It is possible that the moving parts within the motor itself have worn or are getting stuck at some point, causing the softener to make a noise that sounds unnatural and potentially hazardous to the health of the softener. The only way to detect this failure is to observe the softener at the time it is set to regenerate. If it does not start up as it should, you may have a timer motor issue. You will likely need to contact a qualified service professional to replace the motor. Water softeners have a number of valves that may also account for the loud screeching noise that you hear. The valve responsible for releasing the brine solution over the resin, for example, may get clogged and need to be cleaned out. This is another one of those service issues that needs to be addressed by a service professional, especially if your softener is still under warranty. Also, because the softener intercepts household water as it comes into your home, some type of potential blockage from mineral deposit buildup or pipe corrosion could occur at that point as well. The softener does not actually remove the mineral deposits until they are in the softener system itself. The loud screech coming from your water softener may, in fact, not be coming from your water softener at all. Many times the water softener will sit near the hot water heater or other water-using appliances. It is possible that the screeching noise is coming from one of your other appliances, but it may not be directly related to anything that the softener has done. Double-check your other appliances before having your water softener serviced.